Todd Kliman is the food and wine editor and restaurant critic of "The Washingtonian." He won a James Beard Award in 2005 for his writing. "From the Trade Paperback edition." "Who knew a grape could generate so much history, so much commerce, so much entrancing narrative, so much splendid writing. Todd Kliman's The Wild Vine is as brilliantly successful a hybrid as its subject: combining the best characteristics of history and memoir, biography and travelogue, it is an utter delight." 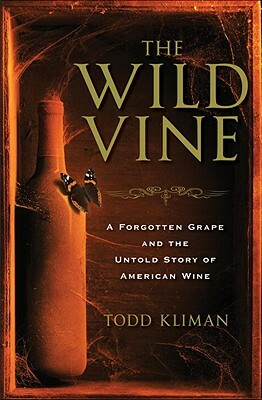 "Todd Kliman's The Wild Vine is beautiful and eye-opening and you'll enjoy it as you would a bracing and wonderful wine. It's a mystery story, a history lesson, a personal journey between hard covers: a great, American vintage." "This book will move you in ways that might surprise you, for The Wild Vine is about much more than an obscure American grape; it's about heartbreak, determination, courage, and humanity. If in vino veritas, this may be the truest story ever told, and Todd Kliman tells it with grace and sensitivity." "A fascinating, well-written and researched cross-generational journey that follows the DNA of a single grape variety that I had never heard of before. I don't know if the Norton grape will make it as one of the great wines of the world, but its history, and the eccentric characters who carried its hope for a wine that could be grown and vinified in Virginia, of all places, makes for page-turning reading." "Kliman tells the ups and downs of Norton with equal panache, pointing a bright light on grape hybrids, an important yet little-known part of the wine world, and introducing a cast of interesting characters along the way. While reading this book, I kept wishing that I had a bottle of Norton at my elbow." "A well-researched and fascinating story that reads like a novel. A true and highly entertaining American tale." "This is a terrific book. If it were a wine, it would be expressive but earthy, subtly spiced, with great structure and a long, lingering finish." "Hold on for an entertaining and enlightening 400-year, transcontinental, trans-cultural investigation of the greatest wine you’ve never heard of. Todd Kliman squeezes a hell of a yarn from a grape."